Aug 11, 2018 filed under Living Virtue. 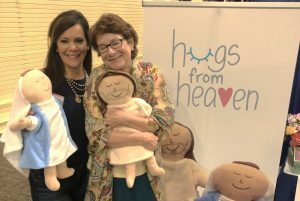 The Catholic Marketing Network Annual Trade Show is 3 hours from my house, so I drove up to Lancaster, Pennsylvania, to see what it was about. Sharing with you some great finds that got me excited. Everything below is produced by faithful Catholics in small businesses whose mission is to promote the Faith. If you purchase from the links, Virtue Connection may receive a small commission at no additional cost to you. The first “find” is a lady who makes rosaries from fresh roses! Julia Miller, founder of FreshRosary.com writes: “The first fresh rosary I made was for my brother Marty’s funeral in 1997. A Naval Reserve Officer, he’d been in Texas, participating in his annual “active duty tour,” when doctors discovered a glut of cancer in his liver. He was 40 years old. “Marty held a true devotion to the Rosary, which he prayed daily. After he received his final sacraments, we wanted to honor him with one last, heartfelt recitation of the Rosary, and just before the final Amen, we witnessed heaven come to earth and retrieve his soul. “We were sweating, and weeping, with seven of us in his small, overly warm ICU room. Maybe someday I’ll find better words, but Marty’s face lit up like a child seeing Christmas for the first time, and I’m certain I saw his soul leave his body – it was like he was wriggling up and out of a turtleneck with his arms at his sides. Right then, a cool breeze circled the ceiling, although the nurse said there was no air conditioning in the room. “At the funeral, among other flower arrangements in red, white and blue, I displayed a Rosary of fresh roses for my brother. “Since then I’ve made too many fresh rosaries to count, but each one is meaningful, because it honors a soul beloved by God, and it connects surviving loved ones to a beautiful and ancient practice of prayer. 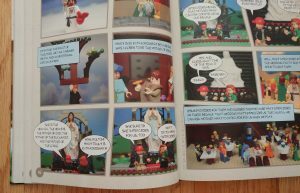 Kevin and Mary O’Neill and their seven children created hundreds of scenes with Legos to create their Catechism of the Seven Sacraments. 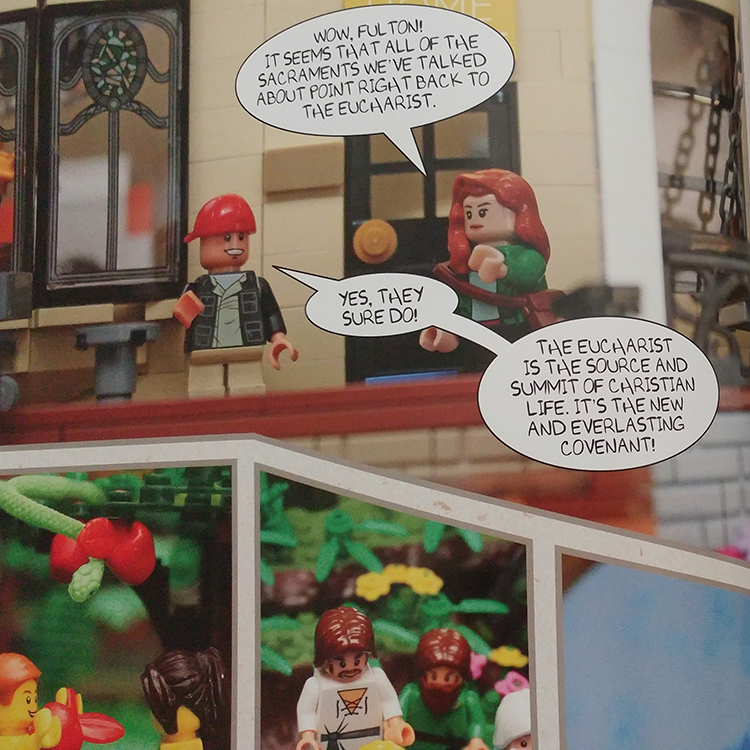 It’s published as a Catechism for children, but I couldn’t stop turning its pages and marveling at how good it is—for any age. “As soon as I opened it, my son took it from my hands, and started reading it immediately. I could barely get him to do anything else (eat, sleep, go to school) until he had finished it. I highly recommend this book, which also helps readers understand how the Sacraments are the fulfillment of so many things in the Old Testament. And last but not least, Seral-Lourdes.com makes lovely medals of the Immaculate Conception. 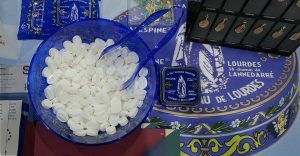 But they also make—are you ready?—mints made from Lourdes water! I tried one and they aren’t bad—and I guess I feel a little holier… :). Rose – our theme for Faithbooking this year relates to Bridges! Your first Catholic find reminds us that God loved us so much that he sent His son Jesus as a bridge to heaven for a desire to lead us there. What a thought-provoking way to incorporate the perfect Bridge! Please post a link to the Faithbooking event in a reply! Aside from the three expressions of prayer, vocal, meditation and contemplative there is action such as the building of the tabernacle in the desert: “They shall make a sanctuary for me that I may dwell in their midst.” Exodus 25:8. The work of our hands can create an expression of faith that can be seen and touched and even tasted by others. Liked your sharing Catholic finds. Especially. Because f I want them I can click and buy them.